Tankers carrying diesel from Asia and Europe, including a giant 200,000 tonne cargo, are sailing towards New York where fuel supplies have dropped to a three-year low in recent weeks. 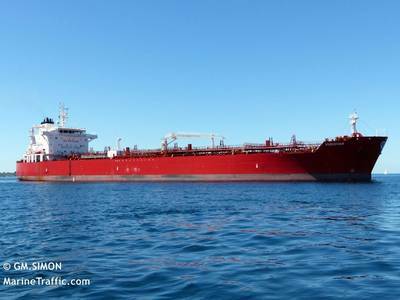 The very large crude carrier (VLCC) Maran Aphrodite changed its destination on Friday to New York from its previous port of Rotterdam, according to Reuters ship tracking data. The vessel, which traders said was chartered by Total, left Singapore earlier this month. Several tankers have also been booked to go from Europe and the Baltics to the port of New York, a relatively rare route. Those include the 60,000 tonne cargo on board the Torm Sofia, chartered by Glencore. Two other cargoes, Vukovar and Aligote were provisionally booked out of the Baltics with options to sail to the U.S. East Coast, the Mediterranean or West Africa, according to shipping data. Diesel supplies in the U.S. East Coast have fallen in recent weeks to the lowest level since 2015, according to the Energy Information Administration. Exports from the Middle East and Asia are expected to rise in the coming months as refineries return from maintenance and due to weak diesel demand in Saudi Arabia, Robert Campbell, head of oil products at consultancy Energy Aspects, said. "We're heading into a period of stocks build," Campbell said. Benchmark diesel refining margins in the U.S. East Coast rose on Friday to their highest since January. Although stocks in the United States are low, stronger imports into storage centres such as New York and the Amsterdam-Rotterdam-Antwerp hub will put pressure on benchmark diesel prices on both sides of the Atlantic, Campbell said. "We could be drawing stocks away from pricing centres, but pricing centres will come under pressure due to large cargo deliveries. There aren’t many ports that can take such large cargoes which will be sold at lower prices."